This is a question in our household that we have to deal with constantly. How can we do this? 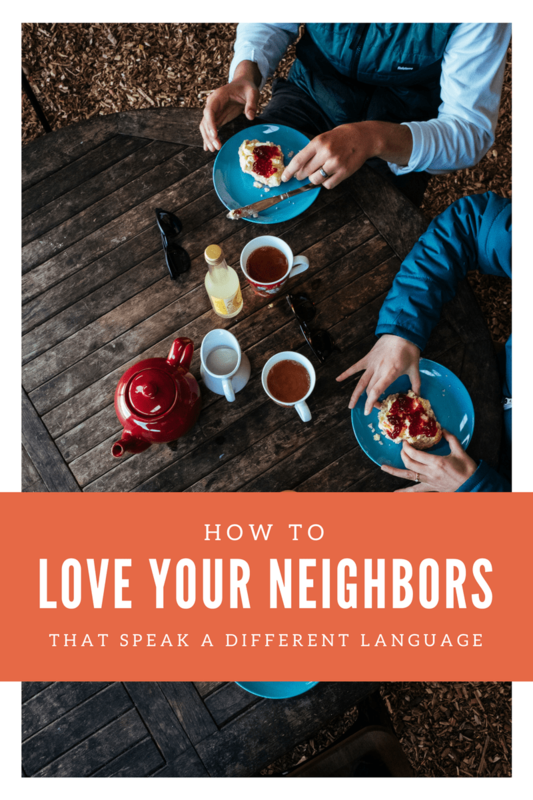 How to love your neighbor that speak a different language? We live in a community in the heart of Louisville Kentucky that we are the minority. Our neighbors are from Congo, Guatemalan, Cuban, Mexican, Indian, Vietnamese, the list goes on. We have a VERY diverse neighborhood. We love it but it is a challenge. The number one question we keep asking is, How to love your neighbors that speak a different language? Guten Tag, Hola, BonJour, Ciao, Salaam. These all mean hello. I think hello translate to all languages. Especially if you do it with a hand gesture. It would mean the world to your neighbor if you took time to learn some simple words in their language. We live next to the sweetest Cuban family. They have been through some sad times over the past two years with the wife and mother passing away with an illness. The elementary boy stood on the front porch one day and just sobbed telling us in the only words he could think to say, “It is just a really bad day”. It took a year of saying hello, waving as we passed on the road and stopping to make small talk and eye contact for the little elementary student to feel comfortable enough to try and express his feelings to us. Who doesn’t love a getting recognized on a special day or from an accomplishment? We don’t have to speak the same language to realize when someone is having a birthday, a baby or maybe an anniversary. After you have lived near your neighbors long enough, you will start to see when birthdays are rolling around. Write those dates down and remember them for the next year. You can celebrate holidays with your neighbors as well. Here are a few ideas that will help you love your neighbor even if all you can say is hello and give them a hug. Bake cookies and deliver to your neighbors on holidays. Write a personalized card for your neighbor and then find someone that can translate it on the back of the card or on a separate sheet of paper. Invite your neighbors over to play the game Win, Lose or Draw. This is an easy game to play even if a language is a barrier. Plan ahead and have cards in both languages. Take a meal over to the home that would help after a birth of a new baby or during the busy holiday season. Our garbage runs on Monday mornings. That is such a busy day in our household. There are many nights my husband slides into home just in time for bed. He will forget to bring the garbage can back to the house. When we get up in the morning, our sweet neighbor will have beat us to the task of bringing it back to the house. He doesn’t speak our language very well but he is serving his neighbors well. He sees a need and he helps. What a blessing he is to us so many times. This is just a small act of service that didn’t take our neighbor no time to do but it is something that speaks volumes to us. We feel loved when he does that. One of the most precious neighbors that we have ever had was when we lived in an apartment complex. We lived across the courtyard from Steve. Steve was that one friend that everyone wants. He was kind, loyal, and always willing to help however he was needed. I will never forget one weekend we were talking with Steve and telling him about our upcoming week and how we are going to be constantly on the go. He was listening. That next week I got a text from Steve that said, I know you are busy this week so when you get home, I have dinner cooked for your family. Steve was listening to us and he found a way to serve us and to love on us. We did have dinner with Steve that week and it was such a relaxing and blessed time together. If it just a simple act of bringing the garbage can back to the house after pick up day or cooking a meal for a very busy family, both of these acts of service are something that will make your neighbor feel loved. Neither of these acts of service requires you to go too far out of your way. Love your neighbors through sharing your resources. I might be a little blunt in this area and probably not many people will agree with me on this but here it goes. If you have it, it is not for you to keep to yourself. You have a blessing of your home, your possession because God has entrusted you with them. You don’t have these blessing to hoard. A Pastor friend of mine said one time, and I have never forgotten it, You are a vessel for blessings to flow through not to stop with you. I totally agree. There are very little material items that I hold tightly to. I am sure there are some things that I hold dearly. Like a ring, my dad gave me or the card that my sweet husband found for me that plays our song or the two pictures of my sweet babies that has always hung in the hall of whatever home we lived in. These are things that I would have a hard time sharing. Share what you have. If you have a neighbor that doesn’t have a weed eater, share your yard tools with them. Let them know that they can come borrow them when they need it. If you have a pool and your neighbors don’t, invite them over to use the pool. Sure, you need to have some kind of guidelines for use but the guidelines are there to make it comfortable for each person, not to withhold a blessing to others. We are called to love others. This actually starts where you are. In your own neighborhood. So challenge yourself to get out and meet your neighbors and at least learn how to say hello in their native language.